We woke up around 8:00, but I guess we were both more tired than we thought, because we dozed off again and didn’t wake up again until 9:15. There was a Cruise Critic Roll Call Meet and Greet in the Crow's Nest at 10:00 so we really had to scramble to get ready and get there on time. We made it, but had to skip breakfast in order to get there on time. Cruise Critic is a web forum for cruising and they have a roll call section where you find your cruise line, ship and cruise, and then you can make contact with others who are on the same cruise. It is a good way to meet some of the people you will be cruising with and arrange group tours and ship activities. After the Meet and Greet, there was a lecture on the history of Portugal by guest lecturer, Milton Keiles, that we wanted to attend so we headed to the showroom to wait for that to start. Our first ports of call on the cruise will be the Azore Islands, Portugal so there will be a series of lectures about the history and culture of Portugal before we arrive. Val had found a trivia team to join at the Meet and Greet so after the lecture she was off to Team Trivia in the Crow’s Nest and I returned to the room to catch up on the blog. Val returned from her team trivia and said her team did very well tying for first place, but unfortunately lost the tie breaker. We were hungry so headed off to the Lido for lunch and then went down to participate in round 1 of a slot tournament. I didn’t do very well, but Val is on the leader board at the bottom in sixth place. Our past experience says that sixth is a precarious spot and will probably not hold up through the next two rounds. After the slot tournament, we went back to our room and spent most of the rest of the afternoon reading out on our balcony. The weather was very nice with a mild temperature, but still a little humid. By late afternoon we were getting a little antsy and decided to go for a walk on the promenade deck. The promenade deck circles the entire ship and makes it a popular spot for walkers; four times around equals one mile. We did our four laps and Val decided she’d had enough, but I decided to push on for another couple of laps. After our walking, we relaxed a while and then it was time to start our evening activities. I gave in and joined Val for the pub trivia tonight (and every night I suppose) at the Mix Lounge. Besides Val and I, we had Roy and Gabriella, and Charles and Judy on our team. Like me, Roy's wife Gabriella wasn't a big trivia fan, but participated anyway. Our team did pretty well, but not well enough to win. After trivia, it was off to dinner where we enjoyed another excellent meal. After dinner we headed to the casino where we had another disappointingly short night. Tonight we are losing an hour's sleep as the time zone changes as we sail east. Unfortunately, this is the first of quite a few hours lost, but we’ll make up the lost hours on the way back with extra hours of sleep. This morning got off to a slow start as it was almost 10:00 when we woke up. I guess the time change really affected us. 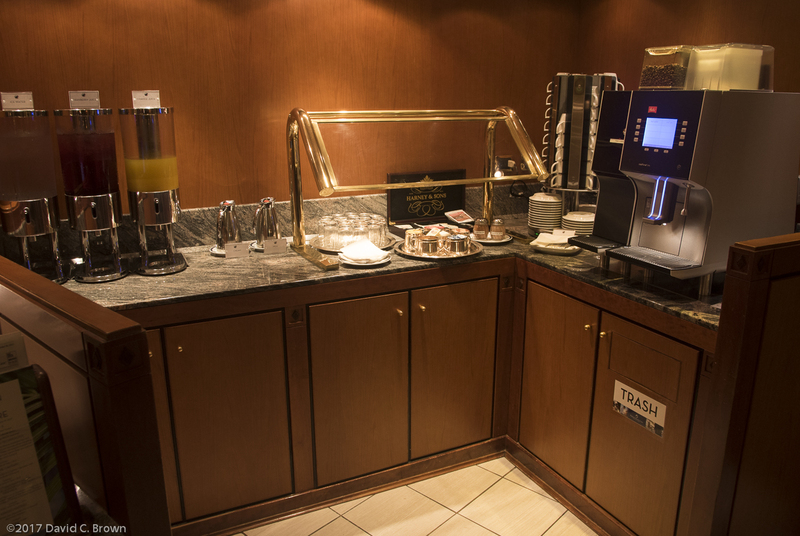 We headed to the Neptune Lounge for our usual continental breakfast and made it just in time before they cleared out the breakfast offerings. The Neptune Lounge is an area reserved for guests in the Neptune or Pinnacle (penthouse) Suites and has food available all day as well as a concierge who takes care of any problems, reservation or anything else you might need, a very nice perk. The concierge on this cruise is Fatima who remembered us from our Inca Empire cruise to South America several years ago. We hung around the Neptune Lounge for a bit while our room was being cleaned and then spent what was left of the morning reading on the balcony. It was less humid and a little cooler, but still comfortable. 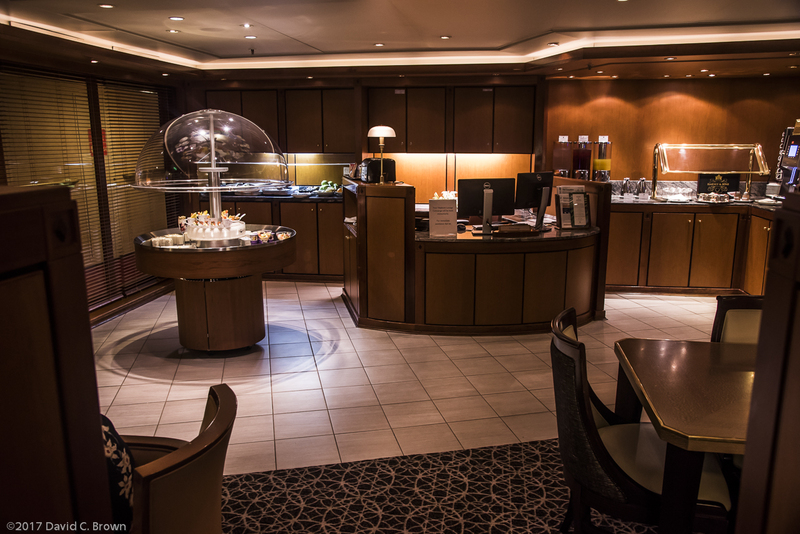 The Neptune Lounge with tables on both sides in the foreground and the concierge's desk in the background. There is food and drink selections available on both sides of the concierge's desk. 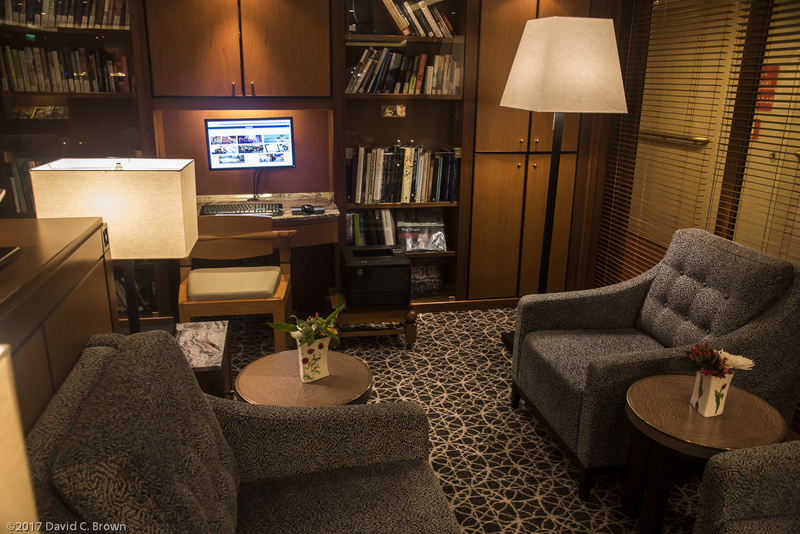 One of the lounge areas. Another lounge area. 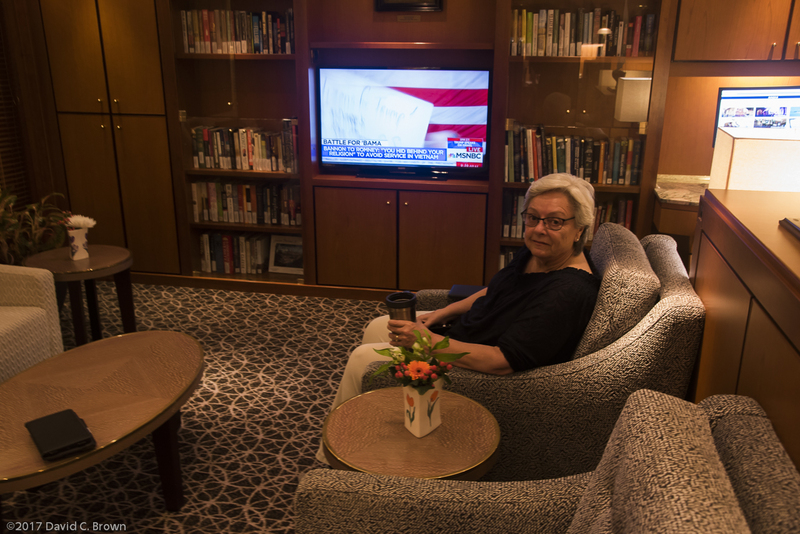 Val is drinking her tea and watching the news while we wait for our room to be cleaned. Some of the food selection available for breakfast. 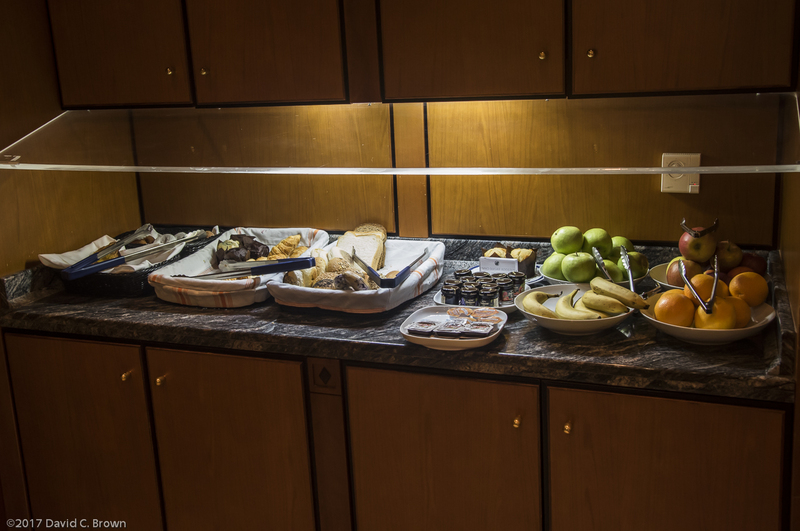 Breads, muffins, pastries and fruit is available. Juices and ice tea are available. 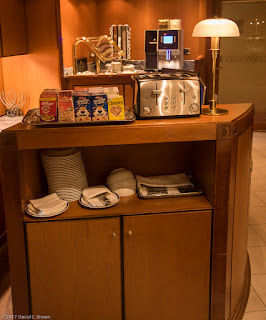 On the right is the coffee machine which in addition to coffee has espresso and cappuccino. Hot water and hot milk are also available, this is where Val gets her hot water for her tea. Our concierge Fatima and the steward that takes care of the food during the day. Both are great. The captain made an announcement this morning that we were diverting our course to Bermuda because of a medical emergency. Evidently a passenger had become ill and treatment was beyond the capabilities of the medical facilities on board so the patient would have to be evacuated and hence the stop in Bermuda. 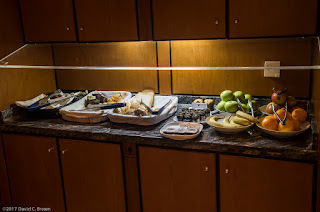 The captain said that they still anticipated getting to our first port in the Azores on time, but the well-being of the passengers always came first which is reassuring. One of the penalties of sleeping late is getting your eating schedule out whack and that is what happened to us. We ate a late breakfast and when lunch time rolled around we were not at all hungry. Val had her team trivia at 1:30 today and the second lecture on Portugal is at 2:00 so we decided to just have a snack in the Neptune Lounge mid-afternoon for our lunch. Tomorrow we have vowed to set our alarm so we don’t sleep away the morning. While Val was at her team trivia I attended the lecture on the culture of Portugal, which was very interesting. 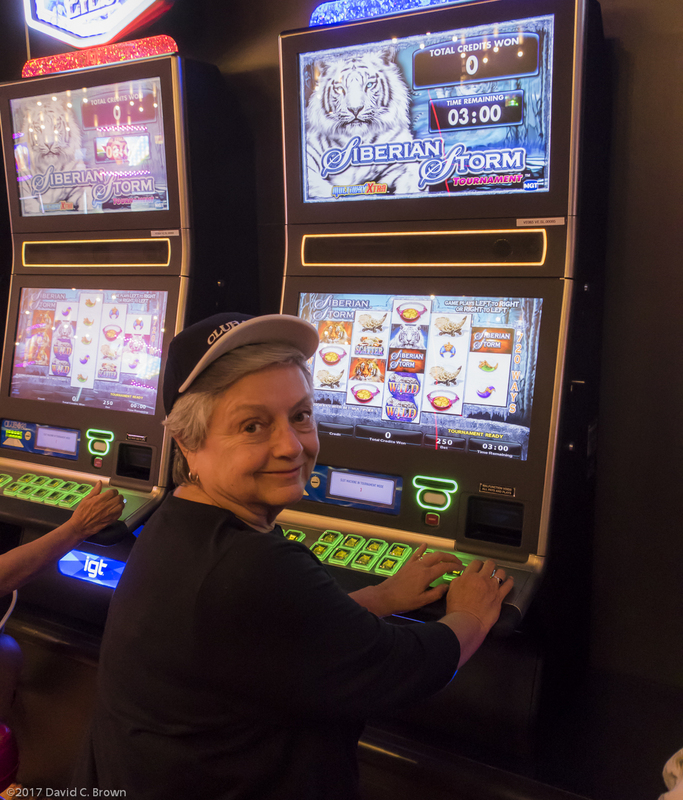 After the lecture I met Val in the casino for the second round of the slot tournament. As expected, Val had fallen off the leader board so we both tried once again to qualify. I once again fell woefully short, but Val shot straight to the top with an amazing 1,400,000 points; that was almost 500,000 points above the former top point getter. She is almost certain to compete in the finals for the $500 prize with that many points. After that it was back to the room for a little reading before it was time for our afternoon walk around the deck. Val and I once again did a mile and then I did another half mile on my own. Tonight is a formal night so we started getting ready a little earlier for dinner and then head off to the evening trivia. It looks like I am once again going to spend my pre-dinner time playing trivia. After trivia, it was off to dinner and then the casino. Tonight, the casino was a little kinder to us and although I didn’t win anything, at least I got to play for a while. Val on the other hand actually came out ahead tonight so she had a very good night. When we returned to the room we went out on the balcony and saw that the boat for the medical evacuation had just arrived so we watched that take place. It was very sad to watch as someone who started out happy and excited to be going on a cruise was now facing a critical situation. It sobered us up and made us realize that could have one of us. Tomorrow is another sea day and we have vowed to get up at a reasonable time and get back on a better schedule. We set our alarm for 8:00 this morning so we didn’t sleep late again and although we would have preferred to stay in bed, we did get up. It’s time we started getting our internal clocks out of west coast time. 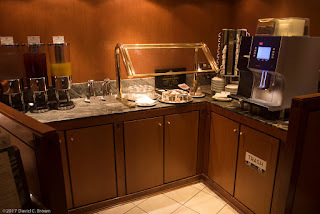 We had our breakfast in the Neptune Lounge and then stayed a little longer while they cleaned our room. We attended a lecture that gave us a short history of Spain, which we enjoyed and then decided to go to the Neptune Lounge for lunch. After lunch Val was off to her team trivia and I went back to our room and read for a while. There was a lecture on the life of Ferdinand Magellan that we wanted to hear so we decided to meet there after Val’s trivia. This was presented by Jim McParland, another guest lecturer on the cruise. Before heading to the lecture, I went to the casino to try one more time to qualify for the finals, but once again I fell woefully short. 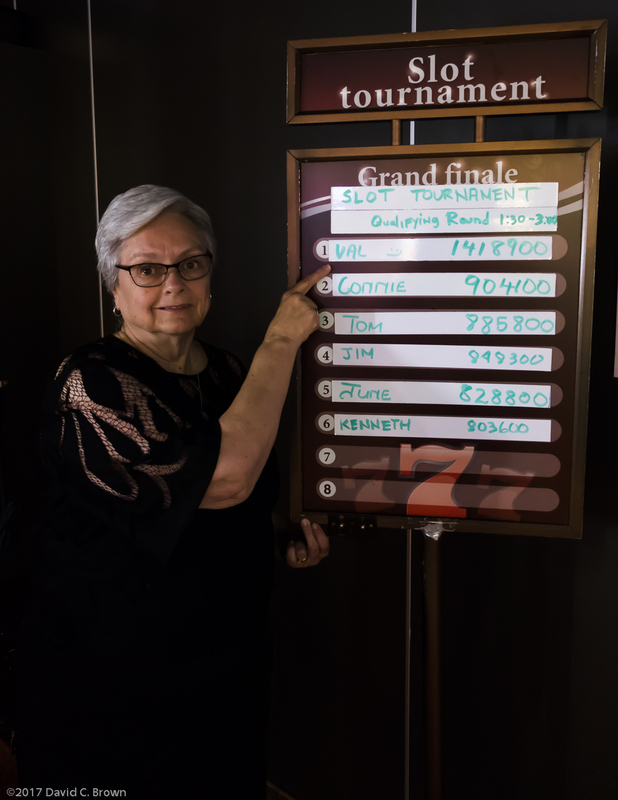 Val was still in the number one spot so she would have to return to casino after the lecture and compete for the $500 prize. When I got to the showroom, where the lecture would take place, Val was already there waiting for me. It was a really interesting lecture, but Val and I had to rush off at the end to get to the slot tournament finals on time. Val had stayed on top and even though someone else had cracked the 1,000,000 point mark, Val was by far the top point getter. Unfortunately, being the top point getter doesn’t mean anything in the finals so except for getting to choose the machine she wanted, everyone started even. Val fell behind early, but made a strong comeback at the end, but unfortunately fell just short and ended up in second place. Oh well, it was fun, but that $500 prize would have been nice. Val's at the top of the leader and qualified for the slot tournament finals. She's all set to go, wearing the casino cap they had the contestants wear, but in the end she fell just short and finished second. 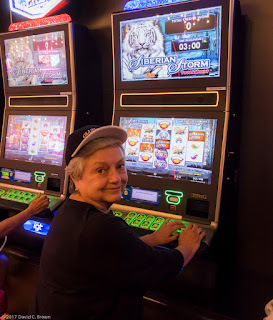 After the slot tournament we returned to our room and while Val relaxed and read, I decided to take my afternoon walk. I did my mile and a half walk around the deck and returned to relax until dinner. After our usual routine of trivia, dinner and the casino we returned to the room and went right to bed as we again lost an hour as we continued our journey east. Neither Val nor I slept very well last night as our west coast time lag continues to give us trouble. We did get up without sleeping too late as we had a busy schedule today. After a quick bite we headed to the showroom for a talk on our next two ports in the Azores. That was followed by a continuation of yesterday’s talk on the life of Magellan so we stayed and listened to that. Very interesting and we learned a lot more than we ever knew about Magellan. There was a suite luncheon today in the Pinnacle Grill (a specialty restaurant) so after the lecture we had to hurry off to that. The suite lunch was very good, but lasted for almost two hours so Val missed her trivia today. From the suite lunch we headed directly to the showroom to hear a lecture on the culture and people of Spain which was a follow up to yesterday’s history of Spain. We had made an appointment with the Future Cruise Consultant so after a short respite we met her in the Neptune Lounge where we discussed future cruise options. We are not going to take such a long cruise next year so we are leaning towards a 14-day Alaskan cruise, but we have to think about it. There are a couple of other cruises we are interested in, but they are just too long for next year. Late in the afternoon I received an e-mail regarding an investment that we had made before we left. There were some papers we had to sign and return. I had to scramble to get it printed, but the concierge in the Neptune Lounge came through and got it done so we will be able to sign and e-mail it tomorrow. A problem averted thanks to Fatima in the Neptune Lounge. Meanwhile, Val didn’t think she would be hungry for a full dinner in the dining room, but decided to go up to the Lido Buffet and get a salad before it was time for evening trivia. I wasn’t really hungry yet and was busy with trying to get our papers printed so I didn’t get anything. By the time I finished with our business, the trivia was already underway and I joined our team in progress. After trivia, we went straight to the casino as we were not going to the dining room tonight. As usual, my money was quickly gone, but Val was once again having success. I grew tired of watching her win and decided to go back to our room and read until bedtime. 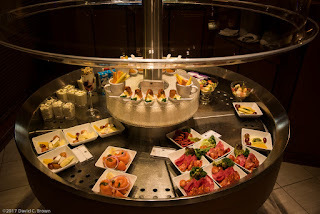 I was starting to get hungry and noticed the Neptune Lounge was still open so I stopped by and had a few snacks. Val returned a little later and had ended up ahead for the night. We lose another hour of sleep tonight so we again went to bed early. I am getting tired of this, but I think we still have two or three more hours to lose before we’re finished with it. The alarm went off this morning and I thought it had been set wrong as it still seemed dark outside. When I opened the curtains, it turned out it wasn’t dark, but very overcast and gloomy outside with pretty rough seas. The captain had been warning us that the seas would get rough and he was right. Val had put on a patch for seasickness last night so she was prepared. Neither one of us is prone to seasickness, but it happened to her once on one of our first cruises so she wasn’t going to take any chances. After looking at the weather, we decided to sleep in a little longer since we didn’t have anything to do this morning. We got up around 9:00 and after getting cleaned up, we headed to the Neptune Lounge for a light breakfast. I had to finish up the papers we had to e-mail and spent the rest of the morning doing that while Val read. Since we had a light breakfast we headed up to the Lido early for lunch and decided to have pizza and salad for lunch. They have a pizza place on the Lido outside pool deck and it is quite good. After lunch, Val was off to her trivia and as usual, I spent the time writing the blog. When Val returned from trivia we headed to the showroom to hear a lecture on the Catalonia area of Spain, which includes Barcelona. Catalonia is the area where there has been so much trouble lately because of their desire to secede from Spain. Every day on the ship they show a movie, which is often surprisingly current. Today the movie was “The Big Sick” which Val and I had wanted to see, but missed when it was in the theater. They have three showings and we decided to go to the afternoon showing as that fit our schedule the best so that was our next activity. We really enjoyed the movie and were glad we took the time to see it. After the movie it was almost time for our dinner activities. After trivia it was the usual dinner and casino and then off to bed. Tomorrow is our last sea day before we reach our first port in the Azores. I thought yesterday I had finally adjusted to the time change, but unfortunately not. I once again woke up in the night and couldn’t get back to sleep and woke up feeling very tired. We slept late and then had to rush around as there was a talk by the port guide on what to do and see in Lisbon, Portugal, our stop after the Azores. After the port talk we stayed on in the showroom to hear a talk on the history of Italy and then headed off to lunch. We shared a table with a nice couple from Winnipeg in Manitoba, Canada and enjoyed talking to them until it was time for Val to head off to trivia. I returned to the room to do the daily blog and rest a little. Val returned from trivia and we left to attend another lecture, this one was on the geography and natural history of the Azores. After the lecture it was back to the room for a little reading before another appointment with the future cruise consultant. Although I had originally told Val that we shouldn’t book another cruise on this trip, we ended up booking two. 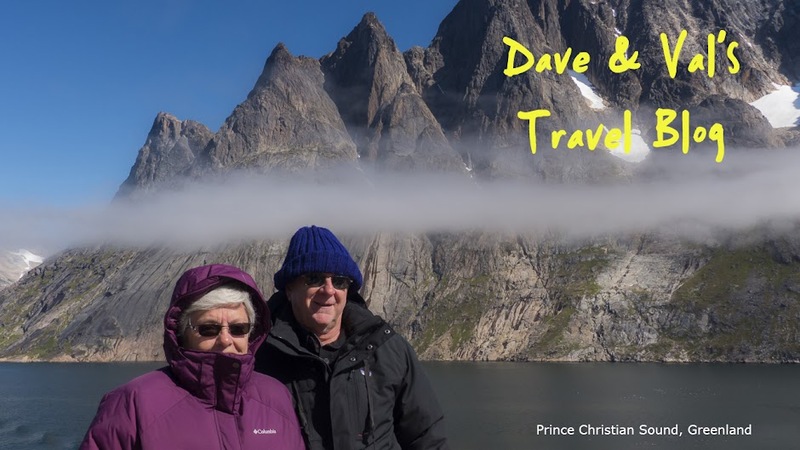 For next year we booked a fourteen day Alaskan cruise, and for 2019 we booked a thirty day cruise called the Amazon Explorer which actually sails up the Amazon. After our meeting with the future cruise consultant it was time to get ready for dinner. We followed our routine of trivia, dinner and the casino and then called it a night. Tomorrow we will arrive in Horta on the island of Faial in the Azores, our first port on the cruise.